They show the story of how the Barons persuaded King John to agree to the Magna Carta, arguably the most important legal document of our history, laying the foundation for justice and freedom, not only in this country but throughout the world. The embroideries are works of art that tell that story, which is what this series all about. 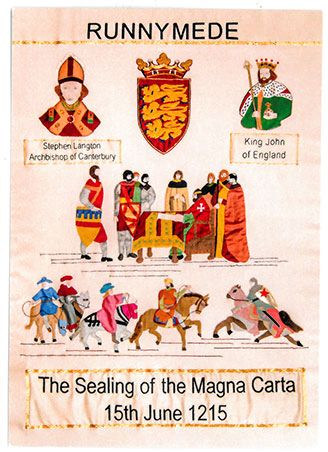 Events that led up to the sealing of the Magna Carta occurred in the Charter Towns. Rhoda Nevins designed the panels to depict these events. Each Magna Carta Trust town has its own panel which are Runnymede, Bury St Edmunds, St Albans, the City of London, Canterbury and Hereford. An additional panel shows the shields of the 25 barons who were present at the sealing. 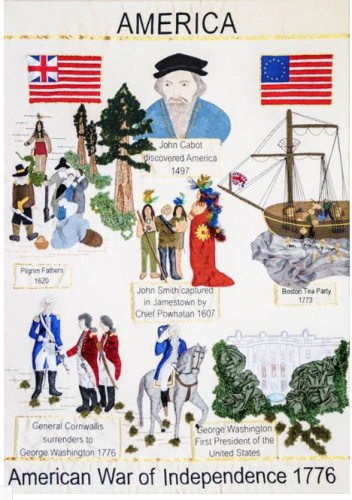 Five more panels tell the story of how the Magna Carta spread law and order throughout the Commonwealth and former British Colonies. There are panels for the United States of America, Canada, Australia, India and South Africa. The following photo was the best reproduction I could find of a panel. The fabric is heavy weight silk with applique and surface embroidery using silk and gold threads. The panels are a lasting legacy to the UK in honour of one of the most important historical events in their history. I just had to include this final photo. When a panel is large and wide there is a problem in reaching the central area. If rolling the fabric onto the width bars is not feasible, then someone has to work from underneath. “Get out and get under” with thoughts of Michelangelo painting the ceiling of the Sistine Chapel. She looks to be as comfortable as she could be in a difficult situation. 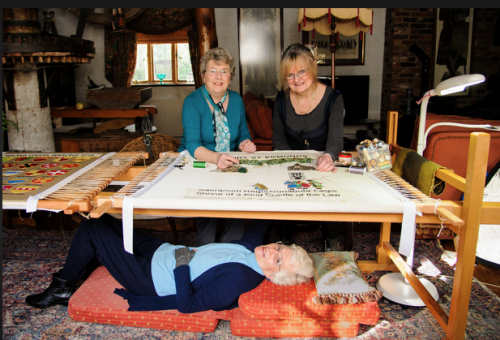 Tomorrow: One final episode which is an update on the Bayeux Tapestry.